Looking for a solution about how to Transfer Music from iPod nano to iPhone 5? 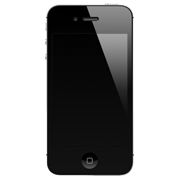 This page will give you a simple software that can help you Transfer Music from iPod nano to iPhone 5. I have iPod nano 5G with a bunch of music on it. Now I have got a new iPhone 5 saved onto my computer with iTunes. I am trying to transfer music from iPod nano 5G to iPhone 5, But I can't figure out how. I'm very frustrated that iTunes just doesn't support to transfer my own music from iPod back to computer. Before answering this question, we want to remind you that Apple simply aims to use this approach to prevent the pirate of iTunes music, if you have do nothing against Apple copyright terms, please read on to get our recommanded transfer music from iPod nano 5G to iPhone 5 solution. 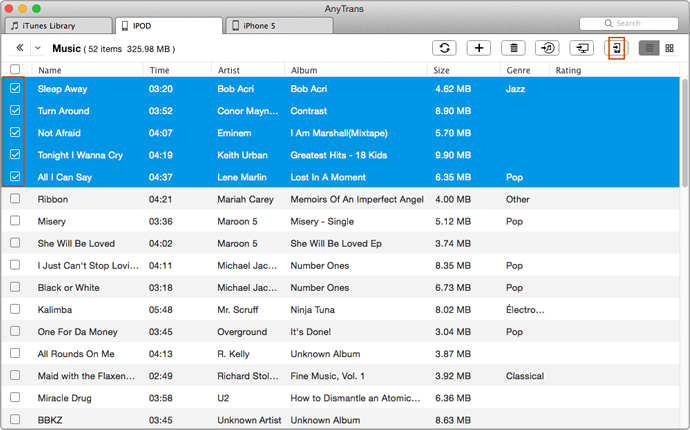 AnyTrans is everything you need to transfer music from iPod nano 5G to iPhone 5. Lately updated to support: iPhone 5, iPod touch 5, new iPod nano 7, the new iPad, iPhone 4S/4, iPod nano 6, etc. 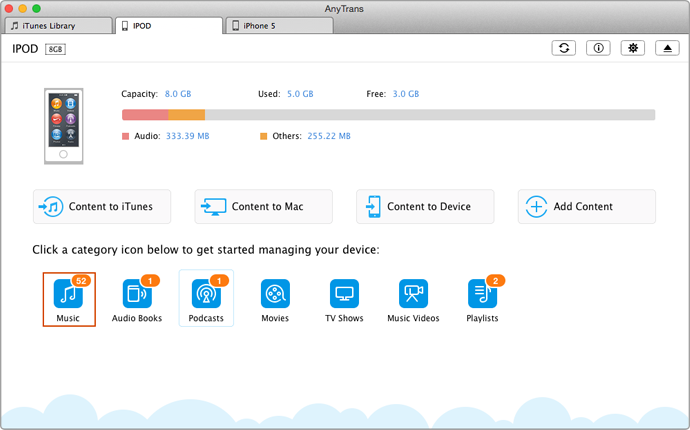 Trying to work around slow & troublesome iTunes sync, AnyTrans gives you a hand to manage iPhone/iPad/iPod without any limits; restore iTunes library from iPods; transfer music across iDevices etc. Highlight the music files you choosed and click To Device option (Shortcut: Right click the mouse and select To Device). Then you can leave it alone and AnyTrans will auto transfer music from iPod nano 5G to iPhone 5.